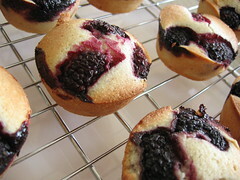 Blackberry Financiers - Do You Know The Muffin Man? Notes: The recipe calls for grinding sliced almonds, but I already had ground almonds so I used: 1 ¾ cups sliced, ground == 124 g ground (based on 1 cup of sliced almonds weighing 70 g). This is very simple to make, as it uses the food processor to combine everything. I was a little worried that it would develop the gluten too much, but there's not a lot of flour. They could have used a few minutes extra baking time, as the area around the frozen berries was still a bit raw. These little cakes are tasty snack-sized treats. Perhaps I've finally found the perfect way to use up egg whites?